Bit concerned about the faceless angels - and even more so about the lack of stars of ever-virginity on the Mother of God's maphorion. Marquetry allows quite fine detail to be used, as has been done with the letters of the divine name in the halo of the Christ-child in the last piece, so why these omissions? I checked and the first icon is a "work in progress" being sold for around U$2K. They are not made by an Orthodox person. Would they still be fit for veneration, or are they just beautiful art? The absence of the stars on the Mother of God is a serious omission. And I do have a problem with work which is made to resemble icons, but is intended as "art". It's one thing to have a print of a Renaissance master, or other non-iconographic art and to know that it can be admired and enjoyed for what it is. Nothing at all wrong with that. But when a work looks like an icon, but isn't, or isn't quite, then regarding it as "art" blurs the boundaries. Great care is taken by hymnographers to write hymns and prayers which accurately reflect and proclaim what the Church teaches and believes. I would feel uneasy at the thought that an Orthodox Christian would choose to display an "iconographic" image as "art", knowing that the image is deficient as an icon. And I do have a problem with work which is made to resemble icons, but is intended as "art". Why can't it be venerated? Because of stars? What about the "Joy of all who Sorrow"? Most, if not all, of the Joy of All Who Sorrow" icons I've seen do have the stars. Most I've seen don't. They have coins but not starts. Is it really bad that those 95% of paintings Orthodox people keep at homes or churches that do not meet the canons are still venerated by them or treated as icons. Is it bad that they buy paper mounts or some printed out as they cannot afford a professional iconographer or cannot contact one? Two very separate questions there. Put another way: If I had the money for a really professional, proper icon, I'd just as well give that money to the church, if I was determined to spend it on something of a religious nature. Is that bad? One need not spend hardly any money for a traditional, canonical, proper icon. Many Athonite monks have only paper icons in their cells. That's why consider the need fo "canonical icon" crusade a bit exaggerated. Not that I do not agree that there are bad icons. I would probably do the same. There's no way I could bring myself to pay large sums of money for a handpainted icon. But paper icons and "canonical icons" are two totally different things, in the sense that there are plenty of canonical paper icons. Paper icons are not uncanonical, unless I've missed the memo. I have previously spoken on this forum on the almost complete takeover of traditional iconography by naturalistic religious art over several centuries, across all the Orthodox world. Much of this was due to official patronage of this “new” religious art, be it by nobles, kings, or emperors of countries where Orthodoxy was the dominant faith. There was no separation of Church and State – indeed, the king/emperor/tsar was a kind of earthly representative of the Church. To this day, the affectionate titles for a Russian priest and his wife are Batiushka and Matushka (Little Father, Little Mother). The same titles were used for the Tsars and Tsarinas of imperial Russia. History shows that many rulers of Orthodox countries, for better and worse, adopted (willingly or otherwise) western customs and mores, and imposed them on their nations or empires. In Russia, this led to the founding of state-sponsored iconographic workshops, which promoted the highly naturalistic “Synodal” or “Academic” styles, as well as imagery commonly found in western religious art. The “iconography” of the Moscow Cathedral of Christ the Savior, commissioned in the 1820s, reflects the almost complete dominance of western imagery over traditional iconography. The Kursk-Root icon of the Mother of God dates from the last decade of the 13th century, and consisted of simply an icon of the Mother of God of the Sign. As the repeatedly miraculous nature of this little icon became known more widely, it was decided at the turn of the seventeenth century, three hundred years after the discovery of the icon, to enlarge and "beautify" it by adding a broad border on which were painted icons of Old Testament prophets, and, in the upper border, an image of God the Father. The inclusion of the latter was hardly surprising, as such imagery had already begun infiltrating iconography. Greece, the other center of Orthodoxy, was not immune from extraneous influences. The Venetians colonized large areas of the Greek mainland, and many of its islands, prior to, or during, the Ottoman period. The Cretan School produced some of the most sublime and reverent iconography anywhere, but, unfortunately, eventually descended into an imitation of renaissance art, losing its liturgical and theological integrity. The progressive westernizing of the works of the iconographers Tzannes and Damaskinos is a good example of this. Keeping this in mind, and that of traveled iconographers themselves incorporating elements of western art in their works, is it any wonder that western forms of religious art soon became the norm? We have the examples of Sts Seraphim of Sarov and Nektarios of Aegina and their veneration of images we know to be suspect. But, are we to condemn these holy men? Are we to say that their sanctity is in question? Of course not. The fact is, that they had little choice but to venerate such images, as these images were everywhere. The hallowed ground of Mt Athos was not immune from these influences – indeed, there is, to this day, a profusion of suspect and uncanonical images on the walls of many of its monasteries. These include NT Trinities, eyes in triangles, and St Joseph the Betrothed holding the young Christ, which are clearly contrary to Orthodox doctrine and theology. The people of Ukraine, Belarus, Moldova, Romania, and other nations in eastern Europe on the border of Orthodox East and Roman Catholic West similarly were surrounded by heterodox images, in all innocence. Can we blame them for holding their beloved Ostrobramskaya, Akhtirskaya, and Diveyevo icons to their hearts? So where does this leave us? God can, if He so chooses, to work His grace through imperfect vessels, be they human beings, or an imperfectly-mounted printed icon (the recent myrrh-streaming icon of St Nicholas), or an image that falls short of canonical guidelines. As He accepts and loves us, despite our multitude of sins and faults, so He has accepted these imperfect images. However, we are also expected to do what we can to “get right” with God. In terms of iconography, we can no longer claim ignorance of canon, scripture or liturgical deposit. It is increasingly difficult to claim illiteracy, geographic and cultural isolation for the perpetuation of images deficient or contrary to Orthodox doctrine and theology. It grieves me that certain people who conduct well-patronized classes in icon painting continue to promote uncanonical and deficient images. I am not convinced that this is being done in honest ignorance. On the other hand, I am heartened that some iconographers are painting “corrective” motifs on their copies of historic but deficient images, such as ensuring the Mother of God bears the three stars of perpetual virginity, that a motif of Christ or the OT Holy Trinity, instead of God the Father, is in the upper border of a Kursk-Root or Derzhavnaya icon of the Mother of God. I have also seen the removal of NT Trinities and eyes in triangles from prominent positions in some Orthodox churches in the city where I live. Small, but very welcome steps in the right direction. please, more decency! Such things make me sad. (But I see your're 18, so I can understand you a bit). Have you forgotten what thread this is? I have no problem if somebody posts such things. But to write that this is funny....mh. And this "icon"- lord of the dance!!!! Kyrie eleison. Who creates such icons do you know maybe? I think remarkable would better express what I think about it than funny. A gay Roman Catholic monk. I kid you not. He's called Robert Lentz and calls himself a master of iconography. Only a master of evil, says Obi Wan. Cyrillic, forgive me for my harsh statements. Nathanael, forgive me my insensitive post. Can't say that I've ever seen a train in an icon before. Here's one with a car. In the early 1950s, St John of Shanghai and San Francisco, who was Bishop of Paris at the time, once served a panikhida (requiem) for an assassinated Serbian noble in a Paris street, on the spot where the murder took place. 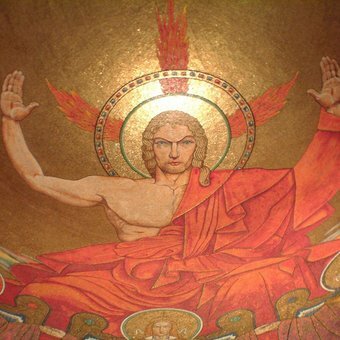 I don't know if this would be "schlock" but this is in the Catholic Basilica of the Immaculate Conception in Washington DC. I think the name of it is "Christ in Majesty." Ghastly. It looks like a 14-year-old schoolboy's LARPing fantasy. A waste of otherwise superb mosaic workmanship. And its "hyper-realism" disqualifies it as an icon. 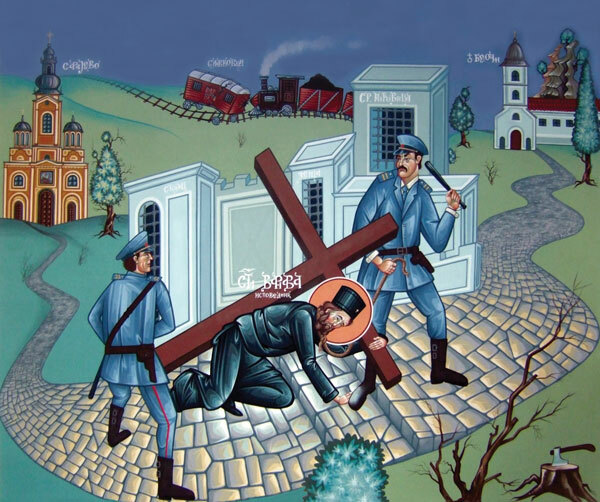 It would be better, for iconographic purposes, if St. Varnava was actually crucified and actually made to carry a cross. Otherwise, it plays into the hands of the folks who want to make the Entrance of the Theotokos into the Temple an allegory. Otherwise, it plays into the hands of the folks who want to make the Entrance of the Theotokos into the Temple an allegory. Joseph or (the Theotokos's father, I can't remember which) being rich in the story confuses me much more, Shanghaiski. Indeed another example of iconography used for playing politics. St Varnava is a confessor-saint, not a martyr. The inscription (the white lettering over the cross he is carrying) correctly says so - ispovednik. Even if he was a martyr, it would be quite sufficient to depict him holding a martyr's cross in his hand. Ran across this one, which I had forgotten about. On the cover of an archdiocesan magazine, no less. What does the scroll say, either my screen or my eyes are failing me. Probably both. "He went and preached unto the spirits in prison." Why the scroll is being broken by someone from Hades makes no sense. Nor why they are all slate-shaded. I would imagine the scroll of our debt is being torn up by Christ being presented it by a demon. Trains and cars? 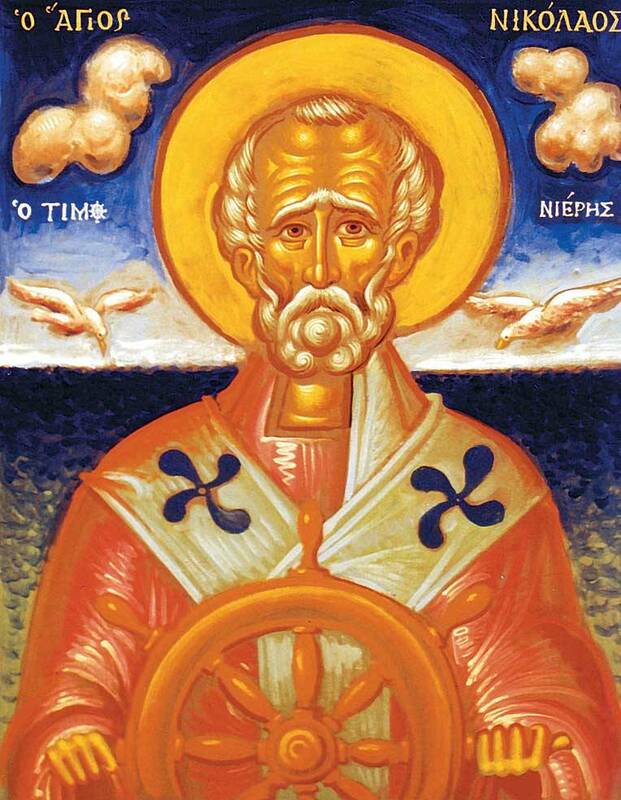 Well I raise you one St. Nicholas steering a boat! You bet it's schlock! It's one thing to recognize St Nicholas of Myra as patron and protector of mariners and fishermen, but this is just disrespectful, cartoonish rubbish. It's by the Orthodox priest who painted the trippy St Andrew and the modernist "Resurrection" I commented on earlier. I call this piece "St Nick the Sailor Man". I'd love to know what patristic or liturgical precedent he used to justify paint the crosses on the saint's omophorion in the shape of propellers .... The next step would be the troparion and kontakion to St Nicholas sung in sea-shanty style during Liturgy. And what's with the seagulls looking for lunch?? Any ideas, folks? It's by the Orthodox priest who painted the trippy St Andrew and the modernist "Resurrection" I commented on earlier. The artist is Catholic (whether Roman or Eastern is not clear), and a good amount of his work reflects non-Orthodox themes such as the Sacred Heart of Jesus and the Immaculate Heart of Mary, various post-schism western saints, the assumption of the Virgin, and St Joseph the Betrothed holding the Christ-child. So it is no surprise to see St Leo the Great wearing the papal triple tiara, even though it would not have existed in St Leo's time. He looks like the singer in Def Leppard. So it is no surprise to see St Leo the Great wearing the papal triple tiara, even though it would not have existed in St Leo's time.